​I love vintage dresses and wear them at every opportunity, even if I’m almost always overdressed. My music taste is off the wall, everything from Ella Fitzgerald to Iron Maiden. I like to travel to places where the scenery and the culture blow the mind. Most of all, I love to spend lazy and crazy days with my family. We have a jet black Spoodle who thinks he’s Paddington Bear. He likes to do everything we do, except wear Christmas jumpers. He HATES Christmas jumpers. My life has been a rollercoaster, with so many rich experiences along the way. I was born in Newcastle Upon Tyne, where I lived in a council estate housing predominately underprivileged families. My childhood was spent dreaming of being a writer and reading Enid Blyton with a torch way past my bedtime. From the age of thirteen I worked weekends in a hairdressers and bakery. When I left school, I spent two years working for a stamp auctioneering company with a wonderful team, but I wanted to explore life outside of northern England, so not long after my eighteenth birthday, I bought a one-way ticket to London. Life in the big smoke was a juggernaut of new experiences. I met Shaun on my nineteenth birthday, who has been my husband and soul mate for over two decades. A new career was forged in the technology industry, which I love because it is constantly changing. In 1996, not long after Nelson Mandela was released from his incarceration on Robben Island, Shaun and I made the decision to move to Cape Town, where we married on the beach overlooking Table Mountain. South Africa is a place of so many contrasts and this post-apartheid era heavily influenced my first novel. Life then took us to Scotland where we lived on a farm and had two beautiful children. It was a wonderful escape from the busy technology world I was working in, then circumstances took us back to South Africa for the second time. My children were young, and I took a career break to enjoy being a mother. My husband was running a restaurant we owned, and we got heavily into renovating properties. For three blissful years, I also began to write in earnest. We were living in a small fishing village in South Africa overlooking the lighthouse, but South Africa was dogged with political problems and violent crime, some which effected our family. I was allowed into a prison cell as part of my research and The Pinstripe Prisoner was born. In 2010, we uprooted to another continent yet again, this time to Western Australia where I had been offered a position back in the technology industry. Today, I am Managing Director on the executive team of a global provider of HR, Staffing, and Technology solutions. I work with amazing talent every day, have travelled to over fifty countries, and play a small part in providing work to 700,000 people per day. It’s incredibly enriching. My children are growing up surrounded by stunning beaches where they enjoy the outdoor life. Family life does not get any better than Perth! '​My dedication to writing continues with a ferocious passion. My laptop and I have developed a special relationship that only my poor husband can truly appreciate. I've found wonderful fiction and scriptwriters' groups through my membership with the Katherine Susannah Pritchard Writers' Centre and have developed a tremendously supportive network of fellow writers. In 2017, The Pinstripe Prisoner began to place in writing competitions and I was already working on a second novel, Jar of Flies. In 2018, two short stories were accepted for anthology publication. I was lucky enough to be signed by Clive Newman at The Newman Agency – for any writer, that moment of securing agent representation is unforgettable! 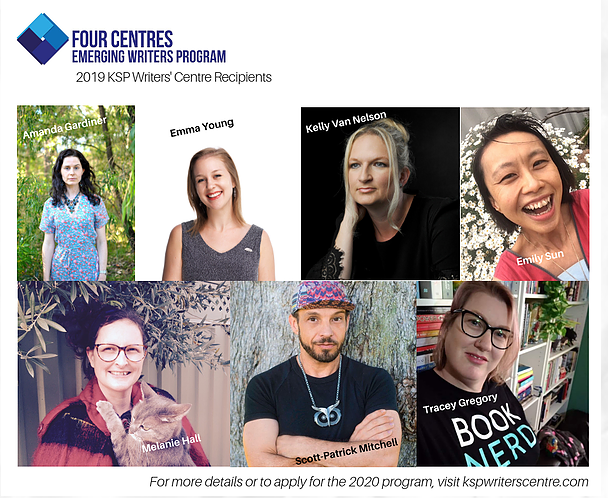 I was recently awarded a First Edition Fellowship through Katharine Susannah Pritchard Writers’ Centre. The fellowship is part of an emerging writer pilot program funded by the Western Australian Department of Local Government, Sports and Cultural Industries and Lotterywest. It presents a wonderful opportunity to continue refining my writing craft. My journey as a working class woman to where I am today has been magical and I’m looking forward to the unknown chapters ahead.